Who we are...and how we can help you. 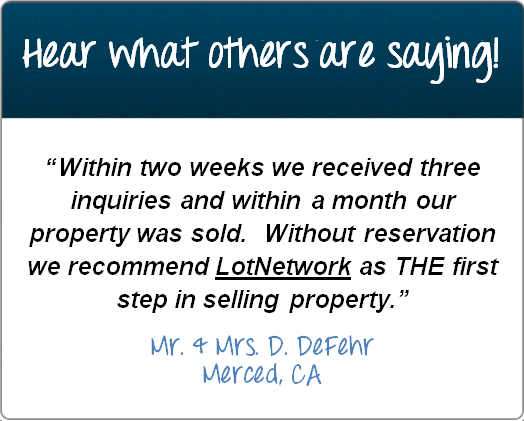 LotNetwork.com is the nation's premier web site for connecting buyers and sellers of residential lots and land. Designed specifically for homesites, residential development, homebuilding and new home communities, it’s The One Site for HomeSites. With over 350,000 listings for lots and developable land for sale, LotNetwork.com helps you buy or sell residential lots and land. Focused solely on residential lots and land for homesites and development, LotNetwork.com gives builders, developers, investors, real estate agents and potential homeowners a better way to connect for their lot and land needs than house-focused listing services or “all-in-one” land and real estate web sites. 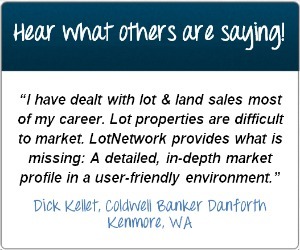 LotNetwork.com cuts through the clutter and irrelevant pages of homes, commercial listings, farmland, hunting and other recreational properties to find just what these buyers are looking for, and what the owners are selling -- residential lots and land. The lifecycle of a new home or community starts with the land. At LotNetwork.com we help our customers buy and sell their land so that they can build new homes and communities...from the ground up. Resources to help you when . . . Learn more about how you can use LotNetwork.com to help you at our Help & Support Center. See some of the LotNetwork reviews and insights from our customers. The team behind LotNetwork.com knows the builder and development industry, having experience with managing developments, investments and real estate transactions throughout the nation. The Information and Tools You Need. Because they have experience as buyers, sellers, developers and marketers, the LotNetwork.com team knows the kind of information and tools you need to market these types of properties and to identify the right opportunity for your next project. Project Listings help homebuilding industry pros (builders, developers and the agents that work with them) market their multiple lot portfolios or development projects to other industry pros that are looking for these types of properties. "Turnkey Listings" are a feature that allow homebuilders to use their lots to sell finished homes. Just mark a lot as a Turnkey Listing and buyers will know that the builder will build a turnkey home just for them...the buyer is happy and the builder can sell before even breaking ground. The "Builder Box" is an area in each Featured or Premium Listing that gathers all the key lot and land information in one place. This helps both buyers and sellers make sure the right information is easily and quickly found. Expand Your Network . . . Expand Your Opportunities. Chances are, you know the main players in your immediate area – but in this recovering economy, your usual network isn’t enough. You need a way to expand your reach and put your listing in front of active buyers, whether they’re across the street or across the country. 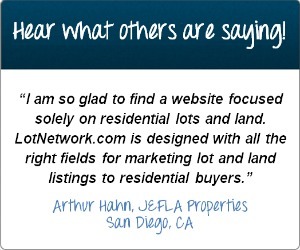 LotNetwork.com helps you build new connections and with over 350,000 active lot and land listings, your next opportunity is just a click away. The LotNetwork.com Team believes what we do is not just about business, it's about making a difference in our world. We encourage community service by our team members and have a number of corporate charitable programs that help us do our part. "Like" Us For A Good Cause -- We periodically use social media to help a good cause that we support, like increasing homeownership or protecting our land. Under one such program, we are donating $1 to Habitat for Humanity for every "Like" we receive on Facebook.